A Scandinavian Airlines (SAS) turboprop carrying 44 people en route from Bergen to Copenhagen whose landing gear failed to fully extend, crash-landed at Copenhagen airport. SAS will stop flying its 27 Dash 8 Q400 planes immediately. In the above story we informed our readers that SAS admitted that prior to Sunday’s accident in Aalborg (2007-09-09), problems with the aircraft’s main landing gear had been identified, and the pilots had prepared for an emergency landing. Now, 2007-10-28 (Saturday) another crash-landing happened of the same type of aircraft with the same carrier. Fortunately nobody was seriously injured. The Q400 accounts for about five per cent of the airline’s passenger load.Scandinavian aviation authorities on Saturday issued a new flight ban on all SAS’s Q400 turboprops shortly after the incident. SAS saw no alternative but to cancel 49 flights on Sunday (2007-10-28), 67 (55 from Copenhagen and 12 from Stockholm) flights on Monday, 44 (37 Cph and 7 from Stockholm) on Tusday and 30 on Wednesday (all Cph, Stockholm nothing posted as of 2007-10-29). SAS grounded its entire fleet of 27 Bombardier-manufactured turboprops for three weeks for inspections and repairs. Flights with the aircraft were resumed in early October. 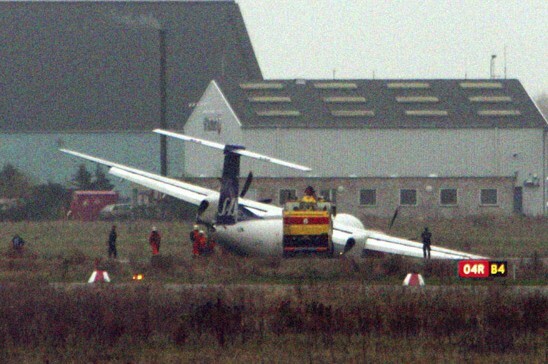 After the 2007-10-27 crash whereby the plane was sliding onto its right wing after the landing gear collapsed (see above picture) the firm issued a press release. – SAS removes Dash 8 from its fleet – took a long time – is this effective risk management or will maybe Horizon Air (USA) purchase these planes and take the risk? At first, SAS’ decision to stop using Q400 planes after the crash landing sounds impressive. Nonetheless, one must still raise the question why its board of directors as well as top management was willing to take these risks? SAS did assess the risk of the landing-gear problem before and has confirmed that it provided its flight crews with special training to cope with a possible crash landing as happend in September in Aalborg and Vilnius. Thereafter, all Q400 planes underwent a check-up that also involved work on the landing gear. Now the planes had just been given a clean bill of health and allowed to resume flights again for SAS. Considering the above facts suggests that making the above decision to remove the planes does not indicate proper risk management. In fact it suggest that the board and top management were wiling to take the risk again with the plane (what maintenance work was really done we will know only after the Danish authorities will release their investigation report in about a year’s time) and pokered too high. Now the firm is left with no other choice but to cut its losses by removing these planes from its fleet. Is that good risk management or does it indicate a failure in risk assessment procedures? The collapse of the main landing gear in the September incidents in Aalborg and Riga has been attributed to corrosion. However, the investigation by Danish and Luthanian authorities has not been completed so far. SAS was the first airline to begin flying the Q400 in January 2000.